Day 3 – The Swiss vs. French for all the marbles! 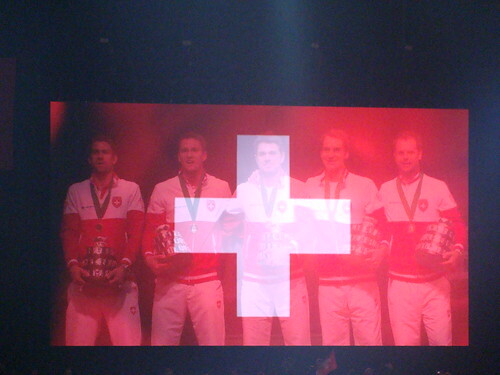 The good news at the start of day 3 of Davis Cup was that the Swiss had two chances to win their first Davis Cup title. France too but let’s try to stay focused shall we? If Roger Federer found himself going down to a resurgent Jo-Wilfred Tsonga, we would all get the match of the day when Stan Wawrinka took on Gael Monfils. This seemed like a win-win to me. 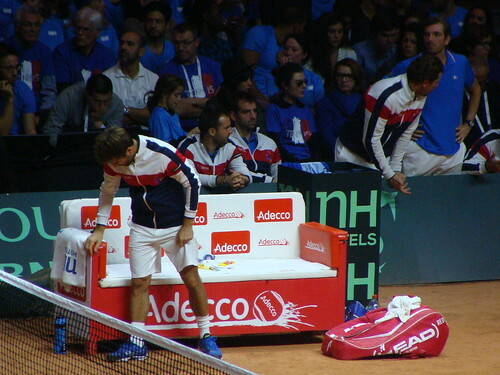 Of course, I wanted no such thing, but I was prepared to deal with it and enjoy a full day at Davis Cup. 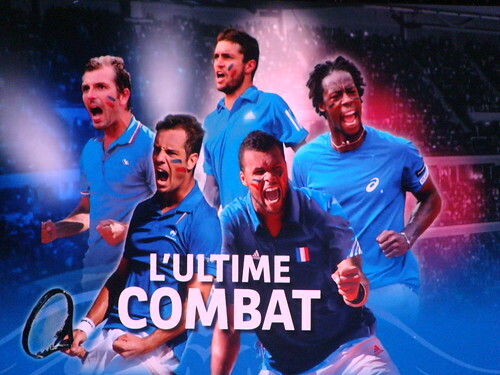 Imagine my surprise when we entered the stadium and the line up for the first match was Federer vs. Richard Gasquet. Did Arnaud Clement see something in Gasquet’s performance in doubles that made him think: yes, this guy can seal the deal for the 4th rubber! If he did, could he point it out to me so that I can continue to better understand the tennis? Alas, Tsonga was injured, so Gasquet took his head-2-head of 2 matches to Federer’s 12 and aimed for a Davis Cup fairytale ending. Bless the French! They didn’t even consider Gilles Simon, who had me and most of the Swiss fans I spoke to shuddering as we experienced Australian Open 2011 AND French Open 2013 flashbacks. I still didn’t relax because this is Davis Cup and this tournament loves to bring the surprises. At the start of the first set, both confidently held to 15 which caused me to sit up in my seat. 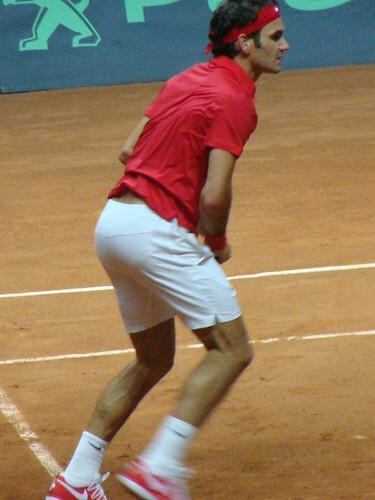 Then in the third game, Federer took Gasquet to deuce and two forehand winners later, he yelled “Come on!’ as he got the break. As he served to consolidate, two quick forehand errors got us to love-30 and I immediately imagined Federer taking the scenic route to this Davis Cup title. Yep, old man you may look good but let’s not take the long route. However, he consolidated and both men would hold their serves until the end of the set, though Federer pushed Gasquet in the 7th game from three game points to deuce and in the 9th game, he had three set points! Gasquet saved most with brave net play and good serving, but Federer could have taken one of them, if only to calm my nerves. Federer served out the set to love for 6-4. At the end of the 44 minute first set, it was clear that Gasquet had decided that he was going to see if his backhand could throw down with Federer’s. As Federer struggled on the backhand side on Friday post his back injury and Gasquet’s makes most people weep with joy, I was edgy. Let’s go backhand to backhand; I can do more with mine! Hot damn! 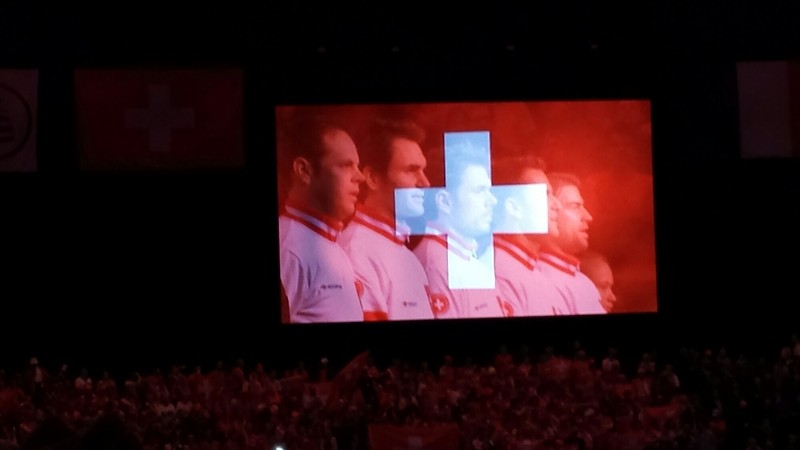 Federer broke to start set two and I was feeling fine and the Swiss surrounding me were singing and dancing. Then he broke for a second time all the while yelling ‘come on!’ and we were high fiving each other in the stands. When Federer served for the set in just over an hour into the match, we still thought there was time for things to go wrong. 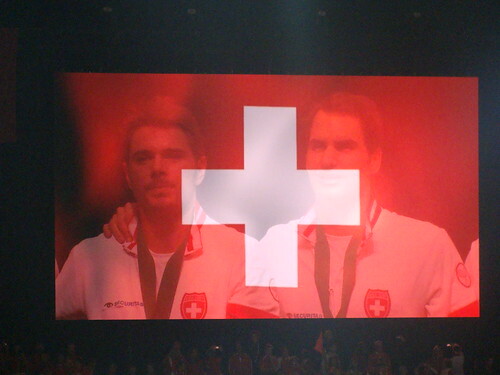 Never fear though, the Swiss kept up a rousing cheer just to make sure Federer knew that we thought he had it in the bag. 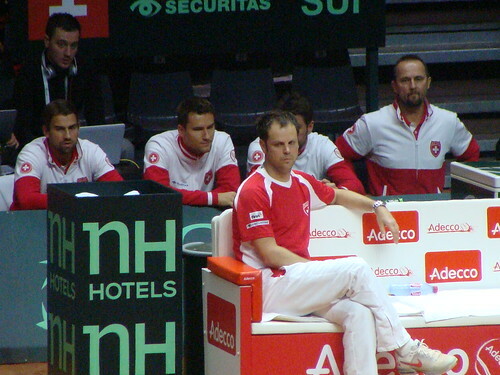 Severin Luthi and the rest of the Swiss team looked coolly unbothered. How cool and calm does Severin look? I was less like Luthi as my travel buddy and I wondered if Federer looked a bit tentative at the start of the third set. 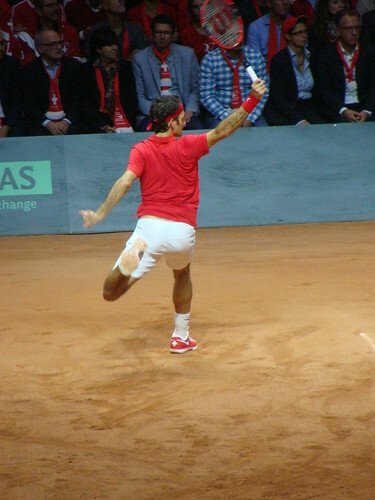 We noticed that Federer’s movement seemed a bit compromised. Would his back sustain a possible 4th set should Gasquet manage a push and nab the third? Clearly, we were seeing things because Federer broke Gasquet after a series of long rallies that had us gasping at line clippers and slices that barely made it over the net. 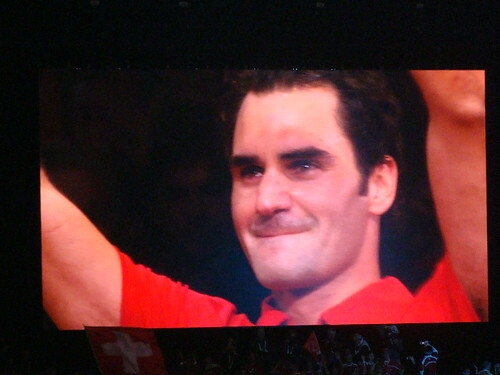 Minutes later, Federer would break for a second time and serve out the set and match to love, all while the Swiss in my section barely managed to stay in their seats for the last game. The ride was over. 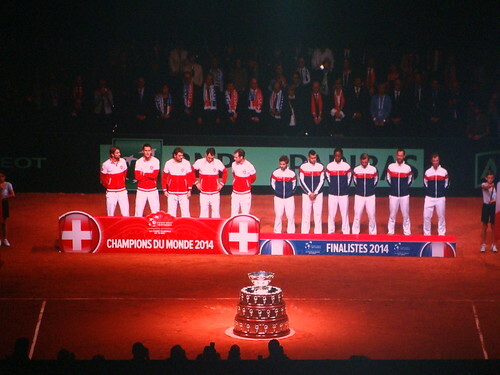 The Swiss had come to France and taken the Davis Cup from the French. 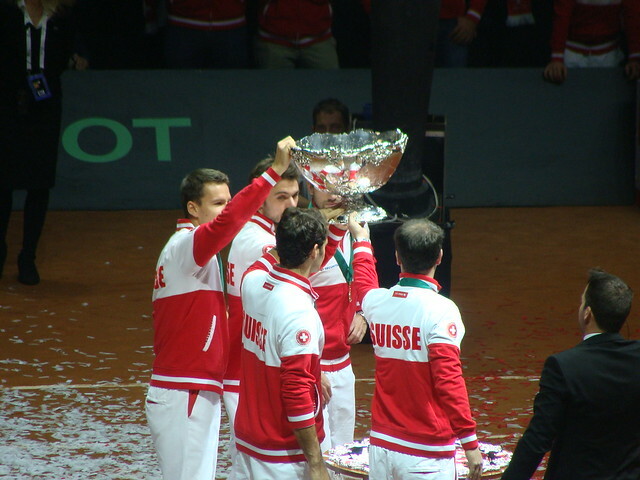 As I watched the Swiss team celebrate, I realized this was a fitting Davis Cup tie for my tennis travel blog. 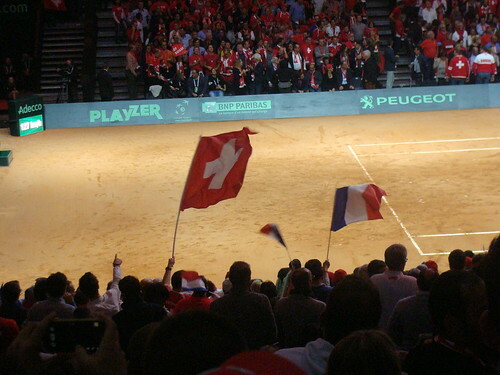 The Swiss vs. USA Davis Cup tie in 2009 in Birmingham, Alabama was what got me on the road to see live tennis. I didn’t see Federer that weekend, but I became a fan of Stan who took down James Blake but fell to Andy Roddick in singles and to the Bryan Brothers with partner, Yves Allegro for the Swiss. 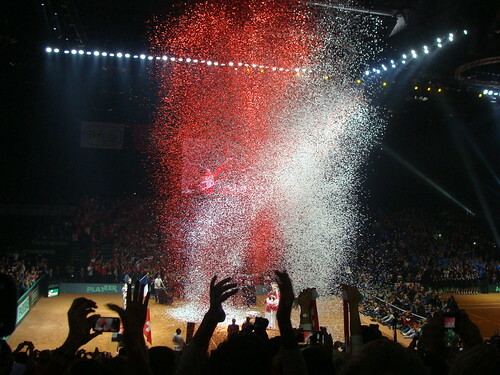 Now, six years later, I traveled to Lille, France for only my second Davis Cup tie and saw the Swiss claim their first Davis Cup title with Stan as the hero and Federer as the man who keeps surprising those who write his career eulogy. A sweet end to the tennis travel year, indeed! Thanks for the memories. 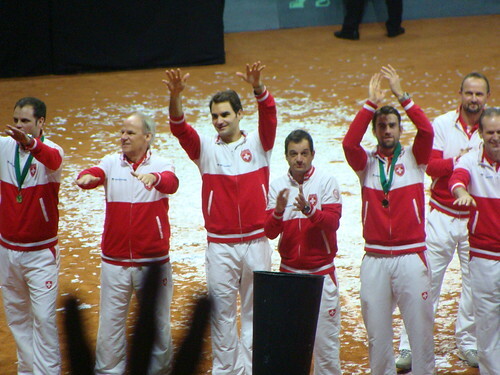 Severin Luth, Roger Federer, Michael Lamer and remaining Swiss team cheer on the Swiss fans.